The Sled Hockey Foundation on Apr 08, 2019. Norm and Adam Page, the President and Vice-president respectively of The Sled Hockey Foundation’s (SHF) Board of Directors, along with Executive Director Steve Wischmann, participated in the first-ever Project Play Western New York (WNY) Conversation event held at the Lexus Club at KeyBank Center on Saturday, March 23, 2019. The four-hour event welcomed over 300 participants from throughout the Western New York youth sports community to discuss growing sports-related recreational activities to reach as many kids as possible throughout the eight-county region. The Sled Hockey Foundation on Mar 18, 2019. The Sled Hockey Foundation (SHF) welcomed another Wounded Warrior Project (WWP) Odyssey group to Western New York. The group of 11 warrior couples and the four WWP support staff took to the ice at the Cattaraugus Community Center on the Seneca Nation of Indians. The sled hockey event, held on Sunday, March 10th, was the first activity of a busy week for the Odyssey participants. Given that the group had just arrived in the area and were settling into the experience, they were reserved at first. It didn’t take long on the ice and the volume went up as many of the warriors and their spouses got fully into the spirit of the sport. Northtown Center in Amherst, NY was the site of yet another great evening of fun on the ice on March 5th for members of the Stone’s Buddies program as they participated with The Sled Hockey Foundation (SHF) in trying the adaptive sport of sled hockey. Stone’s Buddies, an Oishei Children’s Hospital program that supports families coping with chronic and life-threatening illness, has been collaborating with the SHF over the last couple of years to offer sled hockey as a recreational experience for its patients. Alyssa Jerge, Stone’s Buddies Coordinator, took to the ice with the kids and loved the experience. The Sled Hockey Foundation (SHF) conducted another terrific Just Try It event at Cornerstone Arena on Sunday, March 3rd with nearly two dozen people taking to the ice. People young and old strapped into a sled hockey sled and met the challenge of this great adaptive sport. Adam Page, born with spina bifida, a three-time U.S. Paralympic sled hockey gold medalist, and founder of The Sled Hockey Foundation (SHF), skated with everyone and offered tips on playing the sport. The Sled Hockey Foundation on Feb 20, 2019. The Sled Hockey Foundation (SHF) participated in the 12th Annual Buffalo Labatt Blue Pond Hockey Tournament held at RiverWorks from February 14th through the 17th. Norm and Adam Page, President and Vice President of the SHF Board of Directors respectively, and Steve Wischmann, the SHF’s Executive Director staffed an information table, promoted the work of the SHF to change people’s lives through adaptive sports, and supported a sled hockey exhibition game on Saturday by players from the Buffalo Sabres Sled Veterans program, in association with the Buffalo Veterans Affairs Hospital. “The Sled Hockey Foundation enjoys a growing relationship with RiverWorks that will bring more adaptive sport opportunities to the community – it’s great to be here!”, Norm Page commented. The Sled Hockey Foundation (SHF) held its third Just Try It event of this winter season at Canalside on Sunday, February 17th and it was another huge success! Nearly 30 people got in a sled and gave sled hockey a try. People young and old loved it and promised to look for more SHF Just Try It events. Some of the participants were families with children with disabilities coming for a second and third time on the ice. Throngs of people enjoyed the winter weather on Sunday, February 10th and all that Canalside offers, including The Sled Hockey Foundation’s (SHF) Just Try It event – always free of charge to participants. The event, sponsored by Mass Mutual New York State, saw nearly 40 people get in a sled to experience sled hockey. Adam Page, of Lancaster, NY, and a three-time Paralympic Sled Hockey gold medalist with Team USA, took to the ice to skate with everyone. The Sled Hockey Foundation on Feb 05, 2019. The Community Foundation for Greater Buffalo (CFGB) is celebrating throughout 2019 its 100-year anniversary as a benevolent organization in Western New York. A ceremony was held on the morning of January 29th at Kleinhans Music Hall to kick-off the year-long event. Adam Page, the three-time U.S. Paralympic gold medalist in sled hockey, and founder of The Sled Hockey Foundation (SHF), was in attendance to support the event. Adam is a member of the Centennial Awards Selection Committee which is tasked with awarding $1 million across several awards by year’s end. A dozen families with children receiving care at Children’s Hospital in Buffalo took to the ice for some sled hockey fun as The Sled Hockey Foundation (SHF) supported a great event at Northtown Center on Sunday, January 27th. This Just Try It event was the first of three planned for the members of the Stone’s Buddies program to try this tremendous adaptive sport. Stone’s Buddies provides recreational and social activities for chronically ill children and their families. A couple of the kids were back for a second experience with sled hockey having participated last winter at a similar event. The SHF works to link interested children with sled hockey programs in the Western New York region. These events have resulted in several children with disabilities to go on to play sled hockey. The Sled Hockey Foundation on Jan 22, 2019. The Wounded Warrior Project (WWP) took to the ice yet again for some tremendous recreational therapy with The Sled Hockey Foundation. On January 7th a group of injured veterans from all over the country learned sled hockey for the first time in a 90-minute event at the Seneca Nation’s Cattaraugus Community Center. The event challenged the warriors to get comfortable on the ice and perform individual and team-building exercises. The ice came alive with laughter and hollers of mutual support as the group bonded through the physical nature of the event. The evening included talking sessions to discuss what the warriors were experiencing and how this time together was impacting them. To a person, everyone expressed appreciation for the sled hockey time and unique opportunity to bond in a shared situation that was new to all of them. The Sled Hockey Foundation on Dec 19, 2018. The Wounded Warrior Project (WWP) conducted another event with The Sled Hockey Foundation as thirteen warriors experienced new recreational and team-building challenges through sled hockey. The December 9th event was held at the Cattaraugus Community Center, at the Seneca Nation, where the staff and ice were great for the two-hour skate. Following the participants gaining some familiarization with the equipment and ice, Greg Hancock, a Combat Stress Recovery Specialist with the WWP, led the group through some team building exercises. One exercise involved the warriors pairing off and having one member blindfolded and led through a maze of cones aided only by verbal commands from the other member. After a few tries, and changes of blindfolds, the results were impressive as the cooperation among the group was proven. The Sled Hockey Foundation (SHF) conducted its first Canalside Just Try It event for the winter season on Sunday, December 16th – and what a perfect day it was! Nearly 30 people participated in the Just Try It event, enjoying the new challenge of sled hockey under partly sunny skies and temperatures in the mid-30s. Even Santa Claus stopped by for a skate in a sled before heading out on his busy week! This was the first of three scheduled Just Try It events at Canalside for this season. The next two are from 12:00 to 2:00 p.m. on Sundays, January 20th and February 17th. The Sled Hockey Foundation on Nov 29, 2018. Cornerstone Arena in Lockport, New York was full of people young and old all day on Saturday, November 24th as everyone celebrated the Fourth Annual Hockey Day in Lockport – and The Sled Hockey Foundation (SHF) was right in the middle of the exciting action. The nervous anticipation of trying sled hockey gave way to laughter and cheers as ten wounded warriors and their spouses took to the ice at Cornerstone Arena on Friday, November 16th. The Sled Hockey Foundation (SHF) helped the Wounded Warrior Project (WWP) provide a new recreational challenge to the participating warriors. Like several previous SHF events with the WWP, the participants were in Buffalo as part of the ongoing Project Odyssey adventures with groups of wounded veterans. The important association between the SHF and the WWP is providing a unique recreational challenge and therapy to veterans coping with various injuries. Art teacher and writer, April Radder, and Adam Page’s cousin, wanted to do something special to recognize Adam’s achievements in meeting and beating the challenges of spina bifida. Beyond cheering Adam on as he competed and won gold medals with Team USA at the last three Paralympic Games, she wrote and illustrated the children’s book, Adam’s Way. Adam’s Way chronicles Adam’s life from birth to present day, showing the difficulties he and his family faced, and how they supported Adam as he fearlessly overcame his mobility disability to become one of the best sled hockey players in the world. The Sled Hockey Foundation on Nov 12, 2018. The Sled Hockey Foundation (SHF) held its 2018 Dreams Come True Gala on Saturday, October 13th at Salvatore’s Italian Gardens in Depew, NY. The event was the largest of the three annual fundraising Galas to date with over 185 people attending, highlighted by Joe DiLeo and Mass Mutual New York State generously serving as the Event Presenting Sponsor. Among those in attendance included representatives from the sled hockey community, wheelchair lacrosse, the Buffalo Sabres and Buffalo Bandits, along with many supporters and enthusiasts from the adaptive sports community. It was a tremendous evening dedicated to celebrating sled hockey, other adaptive sports, and the athletes who overcome mobility disability to be active in their communities. The Great New York State Fair Hosts the Sled Hockey Foundation – The Largest "Just Try It Event" Ever – So Far! The Sled Hockey Foundation on Sep 24, 2018. The New York State Fair, in Syracuse, New York is an annual celebration of community, summer fun, and amusing delights. This year was no exception and it included The Sled Hockey Foundation (SHF) and a terrific Just Try It sled hockey event on August 30th, Armed Forces Day at the Fair. The SHF conducted the sled hockey event in the new Exposition Center where a clean sheet of ice on the enclosed hockey rink supported over 100 participants in just two hours. Adam Page, the SHF founder, and three-time Paralympic Sled Hockey Gold Medalist with Team USA, greeted fans and took to the ice to skate with everyone. It was a truly fantastic day that saw the most participants of any previous Just Try It event conducted by the SHF – while the Fair also enjoyed record attendance this year. The Sled Hockey Foundation on Aug 14, 2018. The Sled Hockey Foundation (SHF) and the Wounded Warrior Project (WWP) teamed up in July for a special evening of wheelchair lacrosse for a group of women warriors at RiverWorks in Buffalo, NY. The SHF’s founder and inspiration, Adam Page, has not only won three Paralympic gold medals with Team USA but has also started a wheelchair lacrosse team – the Buffalo Bandits. Adam’s Bandits are sponsored by the professional lacrosse team of the same name. Since 2016, the wheelchair lacrosse team has been growing and solidifying its roster and working to provide great recreational fitness for Adam and other sled hockey players during the off-season summer months. The Sled Hockey Foundation on Jun 22, 2018. Holden Miller wanted to take advantage of ice time that was sponsored by The Sled Hockey Foundation (SHF) at Cornerstone Arena, in Lockport, NY, on Father’s Day. His father, Peter, and mother Kristen were happy to oblige, and they ended up having a very unique opportunity – Holden skated one-on-one with 3-time Paralympic sled hockey Gold Medalist Adam Page! The Sled Hockey Foundation on Jun 14, 2018. The energy and excitement were contagious at Northtown Center on Monday evening, June 11th as several children with various disabilities took the ice in sled hockey sleds for the first time. The Just Try It event was part of The Sled Hockey Foundation’s (SHF) partnership with Children’s Hospital, and the Stone’s Buddies program, to offer the great recreational and therapeutic sport of sled hockey to their patient community. "This is so great – I can’t believe how wonderful this is for these kids and their families! ", exclaimed Nicole Dayka, the Interim Director of the Stone’s Buddies program. Adam Page on Jun 12, 2018. The time spent at St Mark’s Elementary School was great! It was nice to see all the kids and especially Owen Gray. The event highlighted the student’s heroes – and each student dressed like their idol. I was honored that Owen chose me as his hero – wow, that was an honor! Owen had made a sled hockey sled out of curtain wires and cardboard. Each student was made-up like a wax figure of their idol. You would go up to each kid and they had a short speech about who they were. It was really cool to see Owen playing me! I had a lot of fun seeing the other kids and getting to meet Owen and see his hard work. The Sled Hockey Foundation on May 25, 2018. The turnout was tremendous at yet another sled hockey event at Cornerstone Arena in Lockport! The Sled Hockey Foundation (SHF) conducted another two-hour Just Try It event on Sunday, May 20th and again enjoyed having Adam Page, a three-time Paralympic Gold Medalist in sled hockey with the U.S. Men’s National Team, present on the ice to skate with over 25 participants. The Sled Hockey Foundation on May 23, 2018. The play was raucous and physical as The Sled Hockey Foundation (SHF) helped a group of wounded warriors experience sled hockey at Northtown Center on Saturday, May 19th. For each of the nine veterans the experience was new, even though a few had skated in their youth. After a few warmup drills, and getting used to the gear, the wounded warriors split into two teams and proceeded to play a very spirited game of sled hockey – holding very little back. There was blood, sweat, and cheers throughout the game. The veterans were in Buffalo as part of the Wounded Warrior Project’s (WWP) ongoing Project Odyssey adventures with groups of wounded veterans. The growing association between the SHF and the WWP is providing a unique recreational challenge and therapy to veterans coping with various injuries. The Sled Hockey Foundation on May 02, 2018. The Sled Hockey Foundation (SHF), in collaboration with the Cornerstone Arena located in Lockport, NY, held a Just Try It event on Sunday, April 29th. Three-time sled hockey gold medalist Adam Page was on hand fresh off team USA’s latest gold medal victory at the 2018 Paralympic Games in PyeongChang, South Korea. Participants of the event were able to try sled hockey, many for the first time, as well as learn the different aspects of the game from Adam himself. Adam was also on hand after the event to sign autographs and discuss team USA’s amazing Paralympic journey from his point of view. “It’s been a great year – unbelievable to win three straight Paralympic Gold Medals! I like sharing that experience with people in the area who want to see sled hockey grow,” commented Adam after the event. The Sled Hockey Foundation on Apr 24, 2018. For the third time in three months The Sled Hockey Foundation (SHF) partnered with the Wounded Warrior Project to conduct a terrific sled hockey event on Saturday, April 14th at Northtown Center. The participating wounded warriors and their spouses enjoyed the recreational and therapeutic benefits of trying sled hockey. The two-hour event included a variety of partner-based skills challenges, as well as plenty of time to just enjoy the ice. Greg Hancock and Allan O’Keefe, both combat stress recovery specialists, were excited to be back in the Buffalo area to work with the veterans and put on a terrific week of activities for the participants. The Sled Hockey Foundation on Mar 26, 2018. The Sled Hockey Foundation (SHF) partnered with the Wounded Warrior Project for a second time in two months to conduct a Just Try It event for eight wounded warriors and their wives on Thursday, March 22, 2018 at HarborCenter. This two-hour event was planned by Allan O’Keefe, a combat stress recovery specialist, with an emphasis on promoting and exercising the unique partnerships that exist between a wounded veteran and their spouse, the primary care giver. A series of activities were conducted on the ice to both challenge the couples, but also to provide a unique way to simply enjoy each other in a new setting. The Sled Hockey Foundation on Mar 15, 2018. The Sled Hockey Foundation (SHF) conducted its last Canalside Just Try It event for the winter season on Sunday, March 4th – and what a great day it was! With the sun shining, temperatures in the low 30s, and lots of people out to savor downtown Buffalo and Canalside, over 50 people enjoyed getting in a sled hockey sled and moving the pucks around. Young and old met the challenge of sled hockey and had a great time! The Sled Hockey Foundation on Mar 14, 2018. The Sled Hockey Foundation (SHF), in collaboration with the Cornerstone Arena located in Lockport, NY, held a Just Try It event on Saturday, March 3rd. This event was in conjunction with USA Hockey’s Hockey Weekend Across America over that entire weekend. Dozens of people came to learn and enjoy sled hockey. Participants were able to try sled hockey equipment and get a feel for how the game is conducted on the ice. People of all ages were able to get into their own individual sleds and experience how these amazing sled hockey athletes can play the sport they love, no matter what physical challenges they may face. The Sled Hockey Foundation on Mar 07, 2018. The 2018 Paralympic games kick off this week in Pyeongchang, South Korea! The puck drops for the first US sled hockey match on Sunday March 11th. Check back here and on Sled Hockey Foundation socials for game updates, highlights, scores, and recaps. Join us for a live viewing event of the gold medal match in Buffalo, New York on March 17th. More details can be found here, with more info coming soon. The Sled Hockey Foundation on Feb 09, 2018. The Sled Hockey Foundation (SHF), in collaboration with the Seneca Nations’ Cattaraugus Community Center (CCC), and Buffalo Sabres organization, conducted the first-ever Just Try It and Hockey Day event at the CCC on Friday, February 2nd. The event was to raise awareness of stand-up and sled hockey and its availability to the Seneca Nation and surrounding communities. Buffalo Sabres’ players, Jordan Nolan (current) and Cody McCormick (former) participated, along with Adam Page, a 2-time Paralympic sled hockey gold medalist with Team USA. All three met with participants, signed autographs, and took to the ice and skated. The Sled Hockey Foundation on Jan 02, 2018. Yesterday, during the New Years day NHL Winter Classic, the official rosters were announced for the 2018 Olympic and Paralympic hockey teams. Meet your 2018 Team USA Sled Hockey Team below! The Sled Hockey Foundation (SHF) was visited by a seasonal celebrity – Santa Claus – at the Just Try It event at Canalside on Sunday, December 17th! Canalside again proved to be a terrific site for a Just Try It event with holiday music playing in the background and dozens of people out to enjoy the cold, but comfortable, winter season. Old St. Nick was in downtown Buffalo before needing to prepare for his big night. Santa got in a sled and had a great time skating with several participating kids and adults. The Sled Hockey Foundation on Dec 07, 2017. The Sled Hockey Foundation (SHF) held a terrific Just Try It event at Canalside on the Sunday following the Thanksgiving holiday. The Canalside Just Try It event is a great way to introduce the sport of sled hockey to a broader audience by getting anyone in a sled who is interested. Most who try the sport comment on the significant challenges of navigating the ice in a sled and the new-found respect they have for the athletes who do so. By raising awareness of the sport, the SHF hopes to also grow support for more area sled hockey programs so that any person living with a disability who wants to participate in this adaptive sport has the opportunity. The Sled Hockey Foundation on Dec 06, 2017. The Sled Hockey Foundation (SHF) participated in the festive Hockey Day in Lockport event held at the Cornerstone Arena on Saturday, November 25th. This event, sponsored by Howell Motors, was very well organized and executed by Shelley Unocic, the Executive Director of Lockport Ice, her staff, and everyone who volunteered to be part of this wonderful day. The Sled Hockey Foundation on Oct 30, 2017. The Sled Hockey Foundation (SHF) held a terrific Just Try It event with Stone’s Buddies and Women & Children’s Hospital on the evening of Thursday, September 21st at Northtown Center. The event was very well attended by over a dozen families with nearly 30 people taking to the ice to experience sled hockey for the first time. The objective of the evening was to introduce sled hockey to the children and families who participate in the Stone’s Buddies program, led by Joanne Koessler-Lana, at Women & Children’s Hospital. The event raised awareness of sled hockey by inviting people to try the sport and learn its therapeutic benefits. Adam Page, a two-time U.S. Paralympic Gold Medalist in sled hockey, and Lancaster native, was present to sign autographs and skate with participants. The Sled Hockey Foundation on Oct 25, 2017. The Sled Hockey Foundation (SHF) held it’s 2017 Grassroots to Gold Medals Fundraising Gala on Saturday, September 23rd at Salvatore’s Italian Gardens in Depew, NY. With 140 people attending, the SHF was honored to have representatives from the sled hockey community, including Warrior sled athletes from the VA Hospital program, their families and friends, along with many supporters and enthusiasts of the sport. It was a great evening to celebrate sled hockey and the athletes who overcome mobility disability to be active in the sport and their communities. The Sled Hockey Foundation on Jul 24, 2017. Team USA has officially been announced for The 2018 Paralympic Winter Games in PyeongChang, South Korea. The newly announced National Sled Team travels to take on the world at the Paralympic games between March 8-18 with a core group of returning veterans and a few new faces. Leading the team will be Guy Gosselin serving as head coach. Gosselin led the team to a silver medal earlier this year at the Para Sled Hockey World Championship in Gangneung, South Korea, and is keen to bring home a gold at the Paralympic games. The Sled Hockey Foundation on Apr 24, 2017. The Sled Hockey Foundation was honored to be part of the Jamestown Lakers Special Hockey Extravaganza Tournament and fundraising event - a celebration of sled and special hockey on Saturday, March 18th at Northwest Arena. The day-long event had the largest attendance ever over its 14 years. The day was capped by a sled hockey game between representatives of the Chautauqua County Sheriff’s Office and the Lakers’ sled hockey team. The game included Adam Page, current U.S. National Sled Hockey player and two-time Paralympic Gold Medalist, and Danny McCoy, a former National Team player and Paralympic Gold Medalist from the Sochi games. The Sled Hockey Foundation on Mar 06, 2017. This year’s Labatt Blue Buffalo Pond Hockey Tournament saw The Sled Hockey Foundation (SHF) staff a promotional table and host a special exhibition game featuring the Buffalo Sabres senior sled hockey team. Showing off this physical and intense, sit-down version of the game at RiverWorks, in front of the large audience the venue provides, was a special opportunity to raise awareness of the sport, the Foundation, and its mission. This year, to commemorate the 10-year anniversary of the Labatt Tournament, The Sled Hockey Foundation designed a special hockey sled as a gift, signed by members of the national team, in recognition of Labatt's support of the sport and their work to give more athletes access to the pursuit. Two More Successful Just Try It Events in the Books! The Sled Hockey Foundation was thrilled to continue its commitment to providing opportunities for people to come out and try the great sport of sled hockey. The objectives of Just Try It events are to raise awareness of the sport, serve as a demonstration of how the specialized equipment allows individuals with disabilities to play hockey, and to educate community members about sled hockey programs in the region. For Just Try It participants, getting in a bucket and skating while also stick handling is a uniquely eye opening event, highlighting the many challenges the sport presents. It gives them a real appreciation for the skills that sled athletes demonstrate. The Sled Hockey Foundation on Aug 24, 2016. To further its critical mission of providing the opportunity for disabled veterans and individuals born with disabilities to participate in the adaptive sport of sled hockey, The Sled Hockey Foundation (SHF) is always looking for opportunities to increase community awareness of this amazing sport and its athletes. To that end, a first of its kind event in Buffalo, NY was held on Friday, July 15, 2016 at the HarborCenter. The “Just Try It” event, conceived by The SHF’s Event Planning Committee, was a tremendously fun and successful evening aimed at drawing attention to sled hockey, some of the stars of the sport, and the ongoing work of The Foundation. The First Annual Sled Hockey Foundation Fundraising Gala: Empowering disabled athletes through the sport of sled hockey. The Sled Hockey Foundation on Mar 26, 2016. On the evening of Friday December 4th, 2015, The Sled Hockey Foundation (SHF) held its first annual fundraising gala at Salvatore’s Italian Gardens restaurant. It was a spectacular evening with nearly 150 people in attendance, including many current and former athletes who have played disabled ice hockey. Among them was Adam Page, the two-time Para-Olympian gold medalist, and co-founder of The SHF, along with his father, Norm, and his teammate Paul Schaus, from the gold medal winning USA sled hockey team in Sochi, Russia. The Sled Hockey Foundation on Dec 24, 2015. This Buffalo News Article sheds light on the huge impact the sport of sled hockey can have for our returning vets. Check out the article nad share your comments! You may already know Marine Corps Seargant and Team USA Captain Josh Sweeney. For an inside look at his road from the front lines to team captain, check out this amazing article from Fox News. The Sled Hockey Foundation on Dec 14, 2015. The Sled Hockey Foundation on Dec 03, 2015. 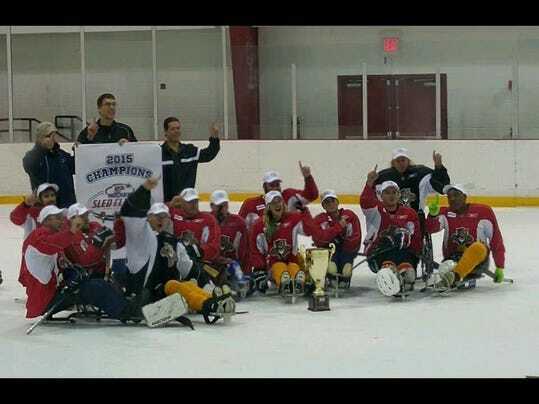 Congratulations to the Florida Bandits on winning the USA Hockey Sled Championship! Check out the link to the full story: Bandits win Championship! The Sled Hockey Foundation on Nov 17, 2015. Team USA's backup goalie was recently featured in USA hockey magazine. Check out the full article on USA Hockey's Site! The Sled Hockey Foundation on May 08, 2015. 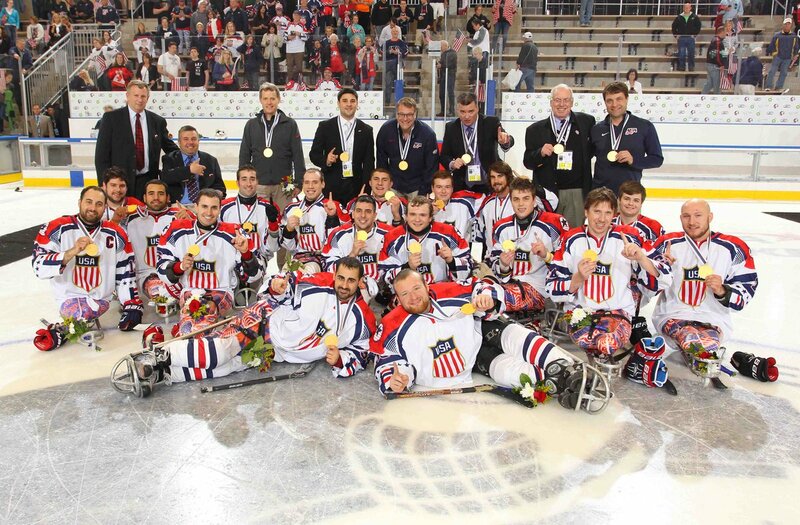 The U.S. National Sled Hockey Team has firmly established itself as the dominant team in the world as it won the 2015 International Paralympic Committee (IPC) Ice Sledge (Sled) Hockey World Championships in a dominant 3-0 performance over Team Canada on Sunday, May 3rd. The games were held at the impressive HarborCenter in downtown Buffalo in front of record crowds, while NBC Sports Group live-streamed the entire tournament to a national television audience. The Sled Hockey Foundation on May 06, 2015. 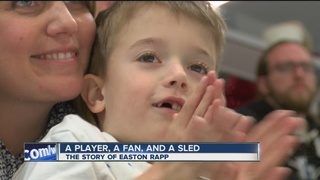 Check out this inspiring story of a 5-year old and his favorite athelete: Sled Hockey Gold Medalist, Adam Page. This past Sunday, the USA national Sled Hockey team entertained a sold out home crowd by beating Canada for the Gold Medal in the 2015 IPC Sledge Hockey World Championships! The gold medal game was a fitting end to a dominating tournament performance by the Americans. The Sled Hockey Foundation on Apr 28, 2015. It's an electric night here at HarborCenter as the fans have poured in to watch Team USA play Germany. The Stars and Stripes soundly beat the Russians 6-1 last night in an Olympic rematch. Tonight they are suffocating a German team struggling to match USA's speed and offensive power. 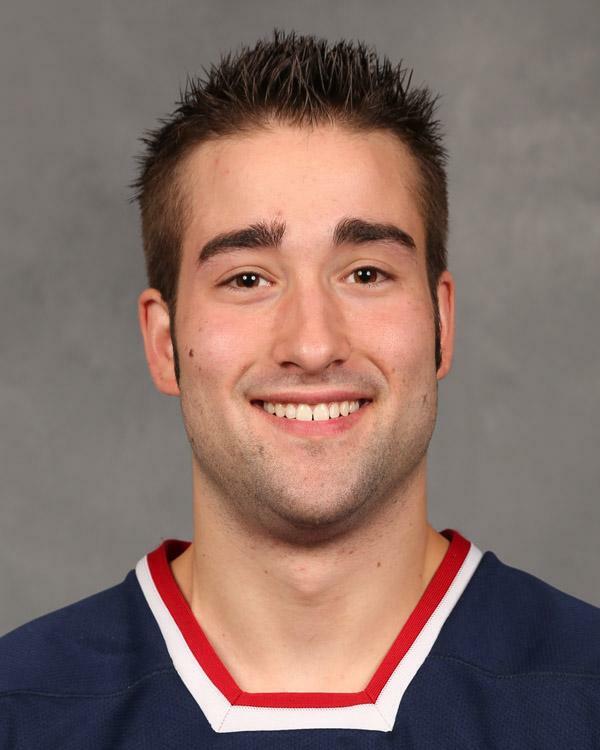 Buffalo's Adam Page has a goal and two assists through two periods of play tonight in a 7-0 match. The assembled throng couldn't be happier. The Sled Hockey Foundation on Apr 27, 2015. Buffalo's Harbor Center was filled with intensity and patriotism as Team USA took on Russia in their Ice Sledge Hockey World Championships opener. A sea of American flags waived in support of the home team as it took the ice against its familiar foe. The two teams had met just one year earlier in the Sochi 2014 Paralympic final. In what was a thrilling rematch, team USA struck first when Brody Royal opened the scoring midway through the first period. Team USA would add two more goals early in the second before Russia’s Ilia Volkov finally pushed one past USA net minder Steve Cash. The third period was all Team USA as they added 3 goals to pad their lead. Their last two goals were scored on consecutive power play/ penalty killing efforts. The Sled Hockey Foundation on Apr 26, 2015. The 2015 International Paralympic Committee Sled Hockey World Championships are underway at HarborCenter in Buffalo, New York! Norway is up on the Szech Republic by a score of 3 to 1 as the third period begins. It has been a fast game with lots of end-to-end action. The international fans are here and the building is energized. The day will build to the formal opening ceremony later tonight just before USA squares off against the Russians - a rematch from the 2014 Olympic games where Team USA won Gold. This is truly a world class event with the attention of the world watching the finest sled hockey players from around the globe compete for a world title. It will be a great week! The Sled Hockey Foundation on Apr 25, 2015. Check out this awesome gallery exposing what practice is like for team USA! "When Josh Sweeney was preparing for the Sochi Paralympics, he tried to explain sledge hockey to friends and acquaintances who just couldn’t quite grasp what he was doing. “Do you play hockey in wheelchairs?” they asked. Sweeney patiently explained the sport he fell in love with, the sport he excelled at and the opportunity he had to help Team USA to its second straight Paralympic gold medal. Upon his return from Sochi, gold medal in hand, the interactions were different." The Sled Hockey Foundation on Apr 11, 2015. The 11th Annual Disabled Hockey Festival is underway at the Northtown Center in Buffalo, New York! It is a wondrous sight to watch disabled athletes from all over the country assemble for three days of ice hockey competition at the largest disabled hockey festival ever held. Over 70 teams and 1,000 athletes are celebrating ice hockey and the compelling camaraderie found at the Festival! The Sled Hockey Foundation is here and hosted a reception last night for people interested in its important mission and the commencement of the Festival. It was exciting to see so many people coming to support the athletes. It is inspiring to hear the excited voices of the hockey players as they move about the rink, going to or from games, thrilled by the immensity of the event and their part in it. The Sled Hockey Foundation on Mar 31, 2015. In less than two weeks, The Norhtowns Center will host the 2015 Disabled Hockey Festival! Check out the schedule below! A lot of hockey to fit into a weekend! The Sled Hockey Foundation on Mar 27, 2015. In what is being treated as a warm up to the upcoming Paralympic Wold Championships in Buffalo, NY, the US National team got off to a great start against Canada in North Carolina. Check out the Full Story! The Sled Hockey Foundation on Mar 24, 2015. In the final tune up before the IPC World Championships in Buffalo, NY, the US National Sled Hockey team takes on Canada in a three day series in North Carolina. Check out the full story from USA Hockey. The Sled Hockey Foundation on Mar 17, 2015. Check out this amazing article and video from KDLT news in Sioux Falls! Where many see obscacles, Sled Hockey provides opportunity. The Lockport Express presented a check to Adam Page of the USA Hockey Sled Hockey Team during this past weekend's playoff action. We would like to send a sincere "Thank You" to our friends at the Lockport Express! Check out the video recap! The World is Coming to Buffalo! The Sled Hockey Foundation on Mar 14, 2015. The great sport of hockey is growing in popularity as more disabled athletes discover and gain access to the sport. Nothing has done more for the visibility of disabled hockey in America generally, and sled hockey especially, than the success of the U.S. National Sled Hockey Team as they have won back-to-back Paralympic Gold Medals. Buffalo, New York will become the epicenter of disabled hockey this spring as it hosts the 11th Annual Disabled Hockey Festival at the Northtown Center complex from April 9th through April 12th. This event offers a tremendous opportunity for people with various disabilities to get on the ice and play hockey. The Sled Hockey Foundation on Feb 17, 2015. Welcome to the official website of The Sled Hockey Foundation! If this is your first time here, be sure to visit the links below for some key information and resources. On our blog, you'll find news updates like this along with posts from our gold winning athletes on their stories and game highlights. Check back often for new content and please reach out if you have any questions or feedback. See you on the ice!